Tomato/Tomato is comprised of husband and wife team, John and Lisa McLaggan. 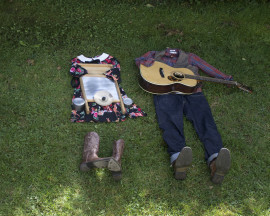 This quirky twosome performs a mix of old timey bluegrass, roots, and folk music. Their dynamic live performances feature John on vocals and guitar and Lisa on vocals, washboard, bass drum, and tambourine. It’s not unusual for her to be doing all four things at once! The duo’s unique sound, strong vocal harmonies, and colourful original music have quickly led to them being one of the most sought-after acts in Southern N.B. They have just released their debut album, “So It Goes”, a strong set of originals that embodies their signature sound and intelligent writing.